Some more fascinating Ashcroft polling out today which, overall, doesn’t look too bad for the Lib Dems. The one big exception is Nick Clegg’s situation in Sheffield Hallam, with another poll showing Labour on course to take his seat. Before this new poll electionforecast gave Clegg an 83% chance of holding on whereas the Polling Observatory‘s last forecast had him at 14%. The Ladbrokes’ odds this morning rated him as a 71% chance. 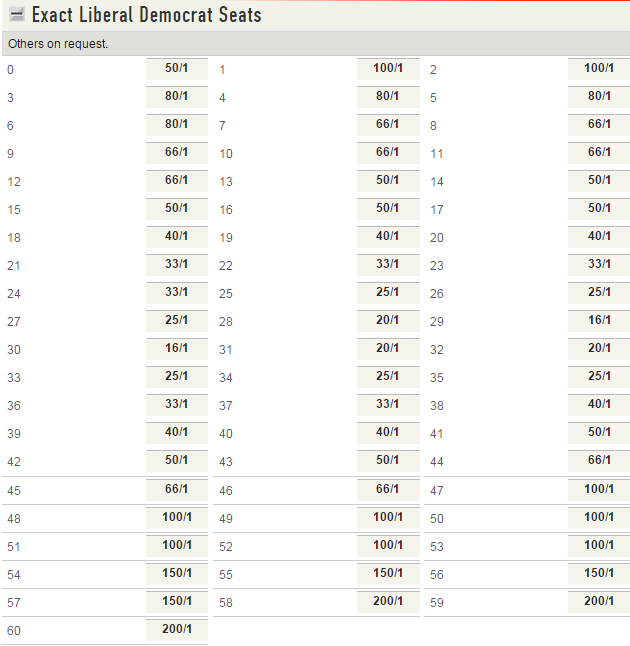 Clegg’s odds have drifted from 2/5 to 4/7 as a result of today’s poll. That works out to suggest he still has around a 57% chance of winning. You can find all of our betting on every single UK constituency here. How many seats will the Lib Dems win? 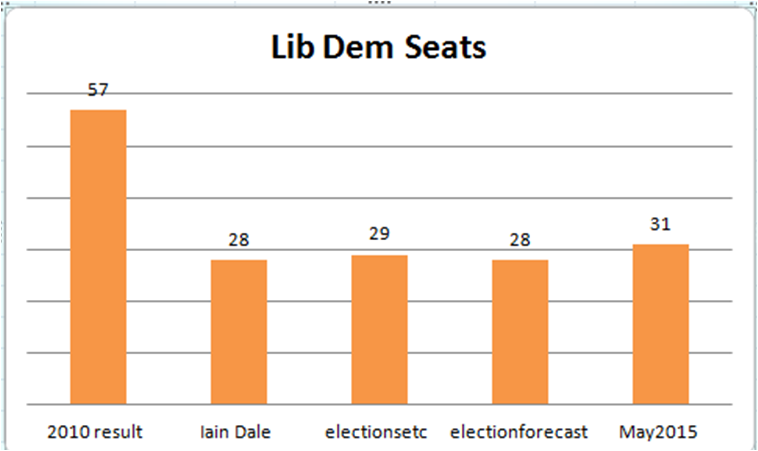 Fancy trying to predict exactly how many seats the Liberal Democrats will win next May? Ladbrokes have now issued some odds on their exact total. Just in case you need any help, I’ve collated some predictions/forecasts from a few others on the chart below. You can read Iain Dale’s seat by seat guide here, which helped him get to his prediction of 28 a few weeks ago. East Dunbartonshire: SNP now favourites. Pretty amazing. Having come fourth with 11% in 2010, the SNP are now favourites to win the East Dunbartonshire seat next May and unseat the Lib Dem incumbent, Jo Swinson. This could be one of the most interesting three way marginals in the whole of the UK, and we’ve seen support for all three main contenders. The shrewdies who took 50/1 about the SNP in the days before the referendum can be quite pleased with their position now. I would advise anyone to have a good look at the FAQs on their site before committing too much money on the basis of their forecasts. Predicting Scottish seats is incredibly tricky at the moment. The basic problem is how much can you anchor forecasts to the 2010 results, or do we just accept that the world of Scottish politics has totally changed and start from scratch? We’ll have a better idea once we get some constituency level polling in the New Year. 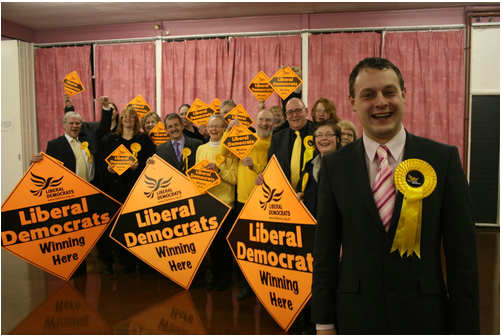 The Liberal Democrat PPC for Ashfield, Jason Zadrozny, has been the subject of some interesting market support to succeed Nick Clegg as party leader in recent days. We added him to the betting at 100/1 a couple of weeks back; he’s now 50/1 and we took some more money at that price today. Sure, we’ve only taken a few hundred pounds on him, but that’s already more than we’ve taken on better known possibilities like Jo Swinson and Simon Hughes. The first major hurdle for him to clear is getting into parliament. 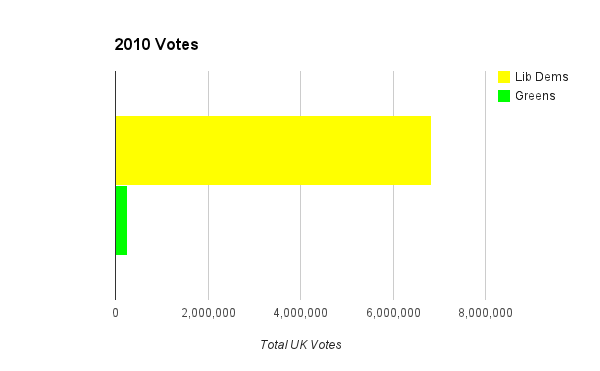 The Lib Dems did a great job of getting within 200 votes of winning the seat in 2010, making it the second biggest Lab-LD swing in the country. It might seem unlikely that they can gain any new seats next May, but we make it only 4/1 that they unseat Gloria De Piero here. This is a seat where it’s easy to imagine that UKIP might poll quite well and disproportionately take votes away from Labour. I suppose it’s extremely unlikely he could win an immediate post-election leadership contest, if Clegg does step down. Perhaps a few years down the line though; after all Clegg was only an MP for two years before he became leader (although he already had a reasonably high profile as a former MEP). One other relatively unknown name to keep an eye on is the PPC for Watford, Dorothy Thornhill. The popular Mayor is only 13/8 to win the seat for the Lib Dems next May and if the party wanted a female leader, there might not be much competition around after the election. 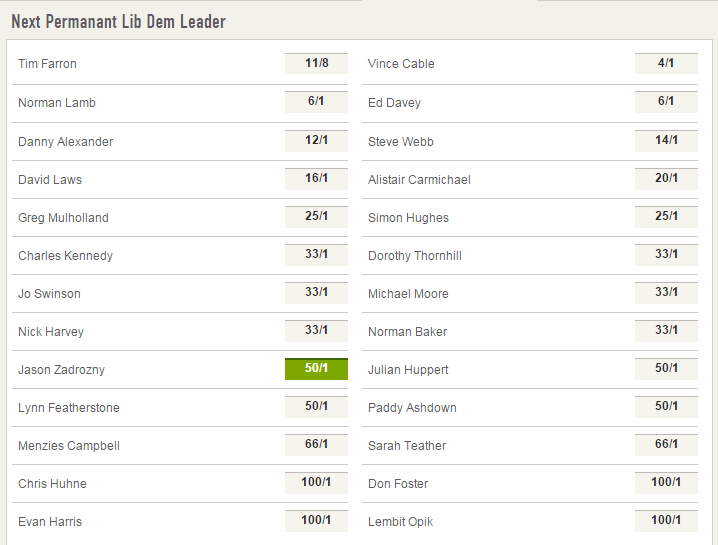 She’s only 33/1 to succeed Clegg.